We are very fortunate to have the opportunity to see art in variety of venues. The San Bernardino County Museum and Arts Connection, the Arts Council of San Bernardino County, have joined to bring Life in the Cracks. The exhibit runs through April 1. On Saturday, March 10, the Museum joins the national Festival of Life in the Cracks Day with participatory art experiences led by the Fallen Fruit art collective from noon to 4 p.m.
Like a Tree Grows In Brooklyn, Life in the Cracks celebrates the slivers of life that flourish in the most unexpected places. The exhibit includes works from Cathy Allen, Christy Roberts Berkowitz, Mary Bierle, Doug Blanc, Mariah Connor, Frederick Fulmer, Barbara Gothard, Sant Khalsa, Thomas McGovern, Paul Morehead, Andrew K. Thompson, and Danielle Giudici Wallis. 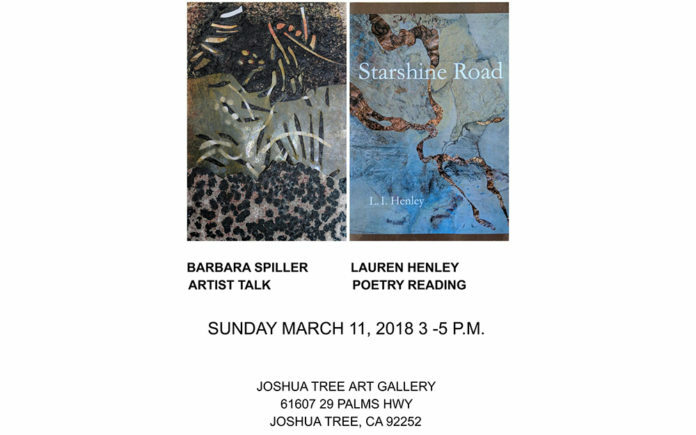 Joshua Tree Art Gallery (JTAG) continues its tradition of art in the High Desert. The latest exhibition opens March 10 and features the work of Barbara Spiller. Her one-person show, Now and Again will feature encaustic works on papers and other works that span over four decades of work. Adding to the experience of the collection, on March 11, the artist will be joined by poet Laura Henley. Henley will read from her latest book of poem, Starshine Road. This collection of poems is inspired by Henley’s coming of age in Joshua Tree and the High Desert. The reading will begin at 3 pm. For more information about Barbara Spiller visit www.barbaraspillerarts.com. JTAG has an exciting event on the horizon. On May 11, JTAG will present a preview of works by Ed Ruscha. A portion of proceeds will benefit the Joshua Tree Highlands Artist Residency program. 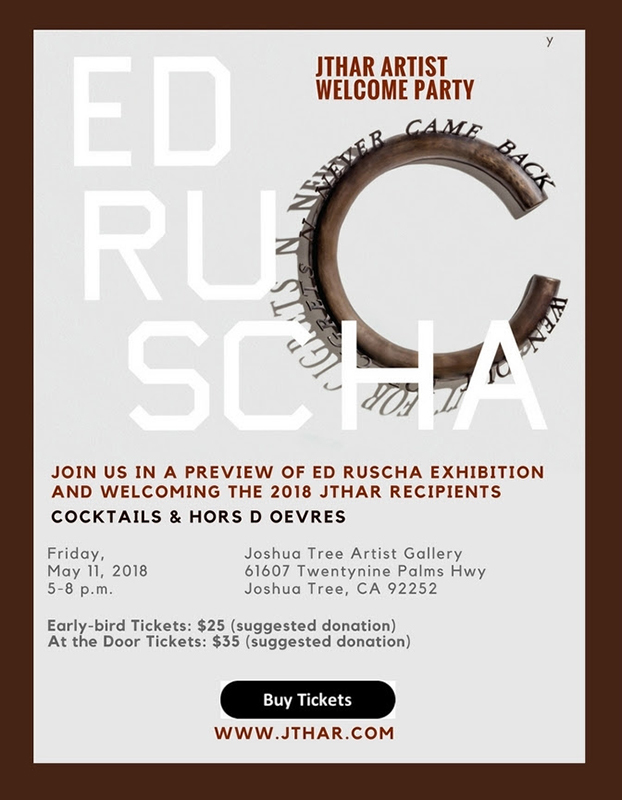 Begun in 2007 this program invites select artists from around the to live, work and create art inspired by the beauty of Joshua Tree. Group and solo residencies of six to seven weeks include scholarship funds, living accommodations, studio space designed to accommodate a broad range of artistic activity and a gallery exhibition. Tickets for this event are $25 in advance and $35 at the door. For more information on JTAG visit www.joshuatreeartgallery.com. For more information on the Joshua Tree Highlands Artist Residency program visit www.jthar.com.